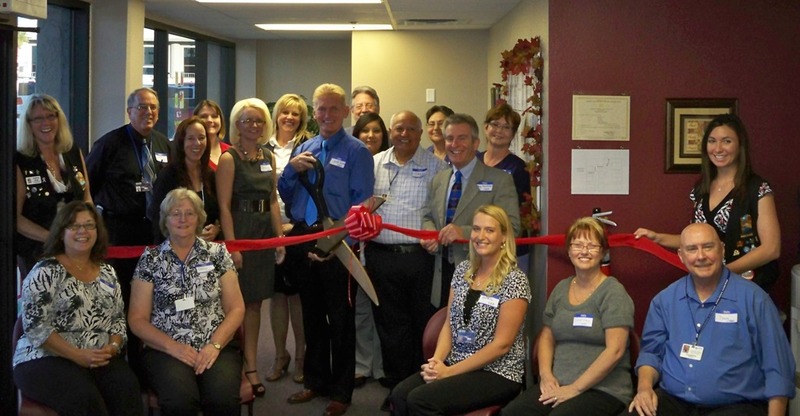 The Lake Havasu Area Chamber of Commerce held a ribbon cutting for the grand opening of the Lake Havasu City office of Southwest Behavioral Health Services located at 1845 McCulloch Boulevard. Southwest Behavioral Health Services strives to provide behavioral health interventions that assist families, children, adolescents, and/or adults in achieving optimal functioning in their personal lives and their community. On hand for the ribbon cutting from left to right standing are; Chamber Ambassador, Audrey Hoyt, Skip Matties, Rhonda Alsobrook, Amanda Hart, Teresa Wood, Lisa Sifling, Southwest Behavioral Health Services CEO, Jeff Jorde, Ron Wilcoxon, Melissa Bavier, Chaz Martinez, Pat Ceccecci, Southwest Behavioral Health Services Vice President, Doug Barshster, Patty Swoboda and Chamber Ambassador, Crystal Alger. From left to right sitting are; Su Hesler, Sherry Sims, April Lantz, Debbie Troy and Doug McEdwards. Southwest Behavioral Health Services can be reached at 453-2661.